The Flatland Digital Artwork Clip Art Gallery: Firefly Evenings in Carolina. 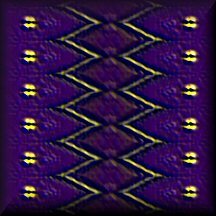 ABSTRACT DIGITAL TILE. An image in digital leather: purple embossed flowers and a column of glowing fireflies---we actually called them "lightning bugs", but "fireflies" is more fey and poetic--- on either end. A serrated column of deeper purple (more aubergine, less violet) runs down the center, bordered with gold; the outer color is blue-violet. It evokes memories of certain late nights back in the Sixties when the children in the neighborhood were allowed to stay out late and play unsupervised. Now you can't even go walking alone in my old neighborhood in my little Carolina milltown. And I think the DDT they used to spray in the air killed off most of the fireflies.